For the past two years, Bess the Book Bus kicked off our nationwide tour at the Transitions Championship in Innisbrook, FL. The seven day golf tournament brought in 2,000 children from Title 1 schools and gave them access to things that are normally out of reach including golf lessons, eye exams and brand new books. 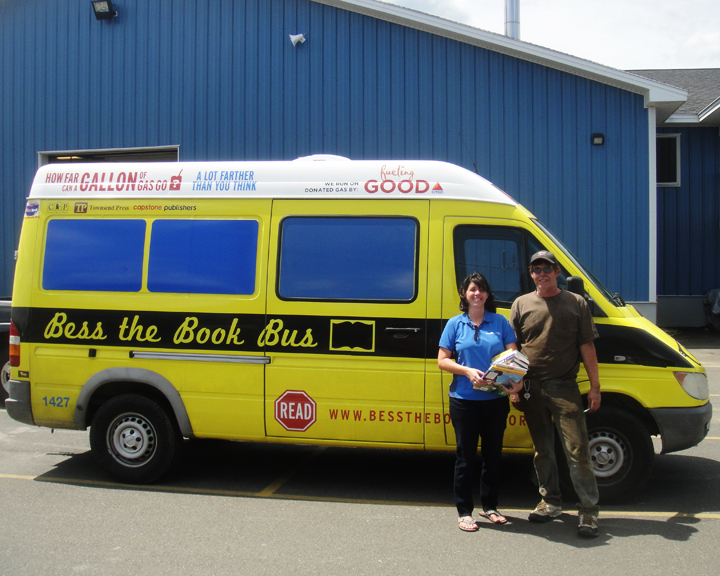 Larry Bicz saw Bess giving away brand new books behind the 18th hole and approached us about bringing the bus to his home town of Buffalo, NY. Larry knew there was need in his community and saw Bess as a way to help. It became a personal mission to make sure that we could come. He helped with everything from hosting to planning. He also brought on Stacy Lund of Entercom Communications to promote our events and increase our impact. Their involvement made it possible for the 2011 Transitions/VSP Success is in Sight tour to travel to Buffalo for three days of outreach. Personal partnerships are a key piece in keeping success in sight for children across the country. We are thankful for similar individuals in New York, Colorado and Maine that make this trip possible. An afternoon on the lawn is a great way spend a sunny afternoon. 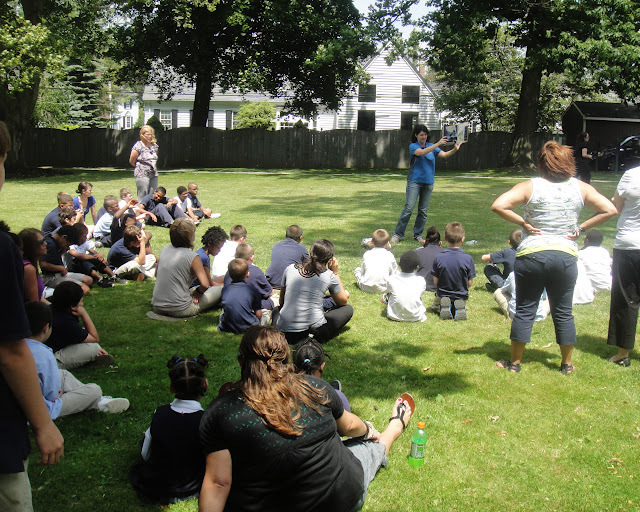 The children in the Big Brothers Big Sisters program joined Bess the Book Bus at The Belle Center for a raucous read aloud on the lawn. As the line formed to pick brand new books, neighbors started to notice. The Belle Center is the resource hub for Western New York and includes programs that help infants through seniors. 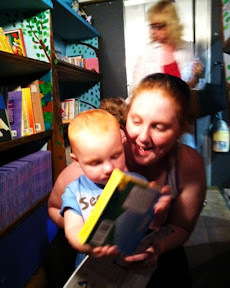 More people arrived at the event, opening access of books to families who can’t afford them. 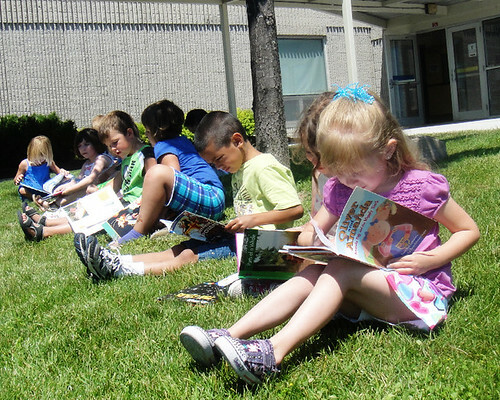 Extra books were donated to The Belle Center to support the preschool and teen programs. Children had thousands of books to choose from including some of their favorite titles from Candlewick Press, Capstone, Penguin and Townsend Press. Summer was in full effect, but some schools were still in session. Bess the Book Bus made special visits to the Stanley G. Falk School and its satellite campus at Public School 53. Stanley G. Falk School provides educational programming for students who have special learning, social, and emotional needs. The Stanley G. Falk School also works with an onsite group home. Our final event in Buffalo was at the local Barnes & Noble. Jennifer was invited to share the stage with Grandma Fay, the resident reader. 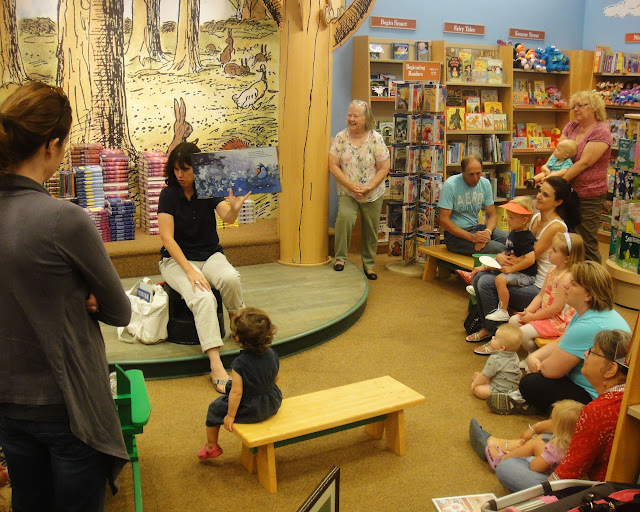 Grandma Fay’s story time has been an in-store staple for six years. Her weekly groups come together for something more than just business as usual. 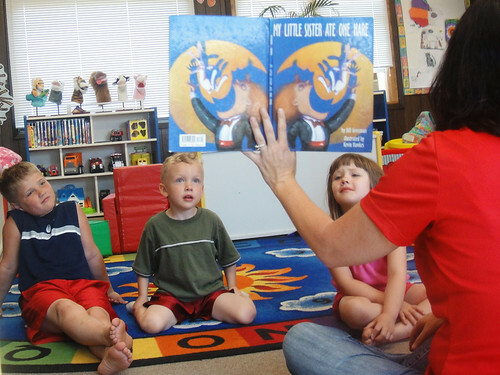 Parents bring children of all ages to get engaged in reading. Grandma Fay includes songs, games and activities to bring her stories to life. Jennifer read Grumpy Bird and Grandma Fay read The Story About Ping. 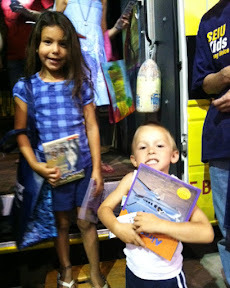 Afterward, children skipped coloring time to come on the bus and pick out brand new books. 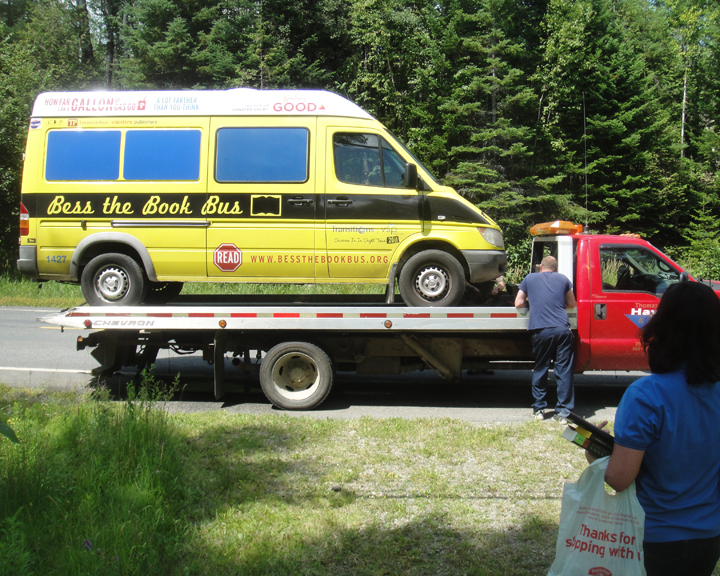 After breaking down on the U.S. 1, Bess the Book Bus gets a ride back to town on "Old Sweetheart"
Kerchunk. That’s how Monday started. The engine went kerchunk, all power was lost, and three check engine lights switched on. There are only a few things that can delay the 2011 Transitions/VSP Success is in Sight tour and an engine killing kerchunk is on that short list. When the kerchunk hit, we were heading South on U.S. 1 to an event in Millinocket, ME. We pulled over to the shoulder and sat on the edge of nowhere, almost halfway between Houlton and Millinocket. Finding a mechanic was going to be a certain challenge. Bess is a 2004 Dodge Sprinter with a Mercedes diesel engine. The nearest Mercedes mechanic was 80 miles away in Bangor. Finding a tow truck willing to take us that far was nearly impossible, even with the help of AAA. As they called dozens of towing companies, receiving one refusal after another, we made calls to possible mechanics. A passing driver saw our flashing hazards and pulled over to check on the situation. Lori was driving her son Nate to golf practice and had to stop, worrying that no one else would. This was a stroke of good luck at the start of an otherwise bad day. Her husband is a volunteer firefighter in Danforth and knew most of the mechanics and tow trucks in the area. Lori and Nate waited until Tom arrived to take their place. And although we thought everything was under control, he chose to keep us company on the side of the road. The first hour passed, then the second. AAA was having no luck finding a towing company. The wait lasted hours. Tom scoffed every time a tow truck refused to come out. The tow was either too far, Bess was too big, or the money made from the tow would not cover their expenses. One company wouldn’t come out because of the risk of moose on the road. In Maine, that is an actual concern. A 3,500 lb moose can total a semi. Logging trucks fearlessly flew by in both directions. Aside from the trucks, the road was quiet. A few cars drove past, two of which were Tom’s friends. The allure of an open hood was too much to pass up. They pulled over and peered inside, nothing looked wrong. No leaks, no blown hoses, no nothing. Based on the description Jennifer gave, it could be the engine’s turbo, the fuel filter or even a sensor. A kerchunk in the engine is a non-technical term and couldn’t rule out much. It was almost noon when Hayes Towing, the only tow truck that would agree to come out, arrived. We waved down the dusty flatbed and the driver stepped out. Jennifer greeted him as he unwrapped the chains and turned on the lift. The tow truck, “Old Sweetheart”, hardly looked big (or sturdy) enough to tow Bess. “Well, I can get her up,” he said. “Let’s hope I can tow her and get her back down.” From behind his mirrored sunglasses, it was hard to tell if it was a joke. Still, he dropped to ground and hooked the chains to Bess’s carriage. The wench turned on and rattled the chains. It was shaky for a moment as fluid leaked from Old Sweetheart’s bed. 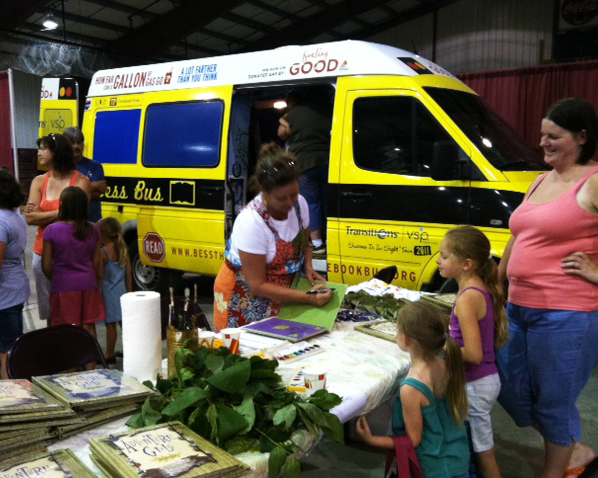 Slowly, Bess and her 3,000 books rolled forward and climbed aboard the truck. Todd could offer no guarantee, but he would try to tow us in. Todd was friendly despite the fact that he had to have his own truck, the one now towing Bess, towed back to the shop by his 15-year-old son and repaired mid way to rescuing us. He had blown a fuel pump and had to replace it prior to coming back out to get Bess. His initial hour drive from Staceyville had now taken him three hours. The tow to Bangor would take an additional two hours, and then he had an hour drive home. This was not going to be a money making endeavor for him, but he knew he was the only driver that had agreed to come out. As we climbed into the cab, Todd offered us a soda and off we went. To get to Bangor, we would need to find a safe place to turn around. As we were turning, Todd got a call. It turned out to be a mechanic friend in Houlton recommending York Toyota, which was great news as it did not seem that Old Sweetheart was going to make the trip to Bangor. Her clutch was failing and the bed was still leaking hydraulic fluid. The ride to town was spent talking and trying to avoid red lights as Todd babied the shifter on his seven speed transmission through the hills and into Houlton. Getting Bess down was went smoothly. The hydraulic bed shifted and gravity took care of the rest. Before Todd made the hour drive back home, we wanted to thank him for his help and hard work. Coming to get Bess was out of the way and dozens of closer tow trucks turned down the job. Despite his own mechanical challenges, Todd was not willing to leave us stranded. 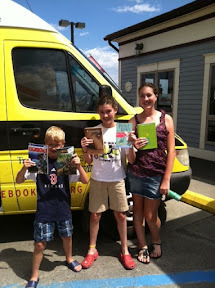 He knew getting Bess the Book Bus back on the road meant getting books into the hands of children. It’s because of people like Todd, people that embody the Fueling Good movement, that we can continue across the country. 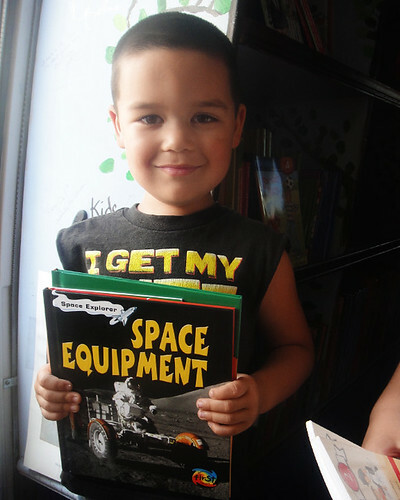 We sent him with a stack of books for his own children and a spot grant of a Citgo gas card worth $130. Thanks for Fueling Good, Todd. Bess’s first breakdown at the start of the trip had set us back, $7,000, but it did not stop us. We were halfway to recouping those costs when the kerchunk sounded. The new repairs mean an additional setback of $1,200 and a serious blow to our budget, but this will not stop us either. We are determined to keep Success in Sight for our kids. The Fueling Good spirit embodied by Lori, Tom, and Todd kept our spirits up too. Fueling Good means doing what you can, when you can, for who you can, where and how you can despite life’s obstacles. We can do that. And thanks to DONATIONS from the folks fueling good at the Citgo refinery in Sulphur, LA and SVS Vision, a Transitions and VSP partner in Detroit, we are $600 closer to being back on track. The Ebersold family suffered a terrible loss when 9-year-old Clayton was fatally struck by a car in 2007. Clayton crossed the road to check the mail, hopeful to find a brand new book inside. There was no package and as Clayton crossed back, he was hit by a station wagon in front of his home in Fredonia, WI. The book arrived two days after Clayton passed and was buried with Clayton. Books were a fond part of Clayton’s memory that became his legacy. He was a veracious reader and always had a book nearby. His family kept extra books in the car in case he finished one while out at the grocery store. Classmates at Ozaukee elementary were encouraged by Clayton to find exciting new reads. After Clayton’s untimely passing, his family found a way to keep that passion alive. 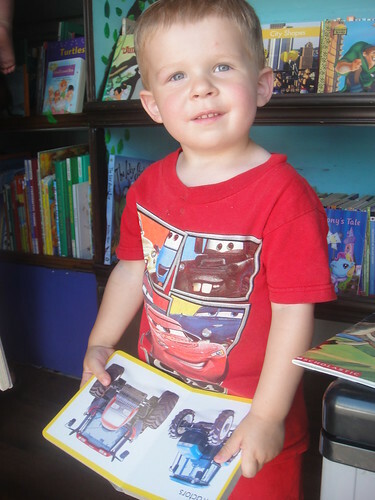 The Ebersold family started Clayton’s Collection, an annual book drive, to share the joy that Clayton found in the pages of a book. It’s also a way for the Ebersolds to come together over Clayton’s love. Cheryl and Clinton, Clayton’s parents, collect books from local businesses and organizations. After school and on weekends, Cayleigh helps sort the books and attach her brother’s picture and memorial. In its four year history, Clayton’s Collections brought in more than 13,000 books. The first year’s books were sent to victims of Hurricane Katrina. The following year supported flood victims in Tennessee. In 2009, Cheryl saw Bess the Book Bus in People Magazine and saw a chance to share Clayton’s love, Clayton’s story, across the country. Bess traveled to Wisconsin in 2010 to receive the Ebersolds’ gift. We embraced Clayton’s memory by dedicating a special special shelf for his books and always keeping his picture on board. 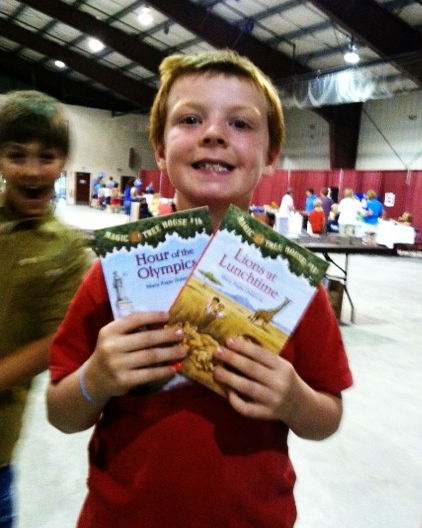 His books reached coast to coast, helping children who need encouraging friends like Clayton to keep reading. “We will remember Clayton Ebersold as our kind friend who had a passion for reading and cared enough about each of us to share what he had learn so that we could learn too. We met the Franklin family on their way back from a family reunion. It’s a four hour drive back to Chicago, and brand new books are a great way to pass the time. 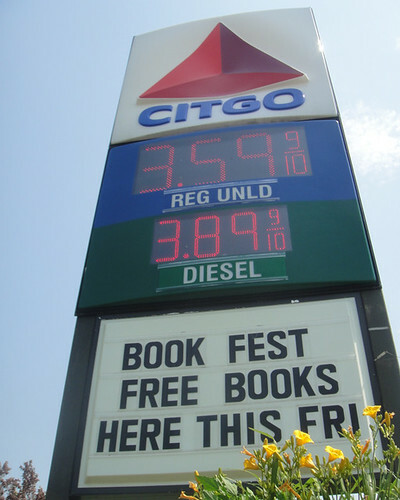 Ily (short for I love you) and Carlie were two of the first children at the Janesville Citgo to pick books. The sisters had thousands of books to choose from and found the perfect titles for summer reading. The Green Bay Citgo station was the perfect place to grab a cup of coffee. Andrew and Leanne thought it was the perfect place to grab some brand new books. Even after a half dozen stops, the shelves are still full. 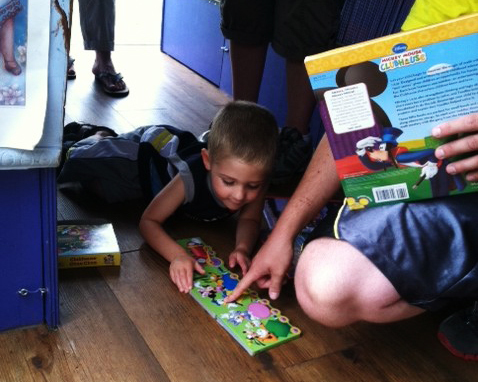 More than 100 children came aboard Bess the Book Bus to pick out a brand new book. 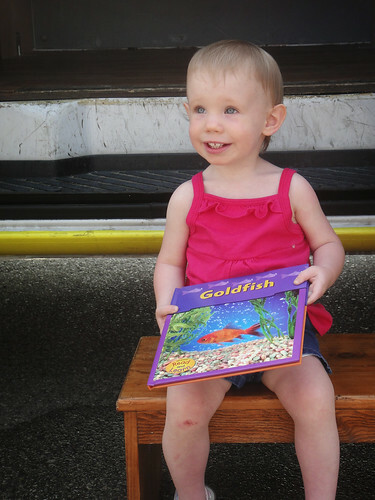 The Appleton Book Fest brought out some of the best children in city, like Alice who loved her brand new book. 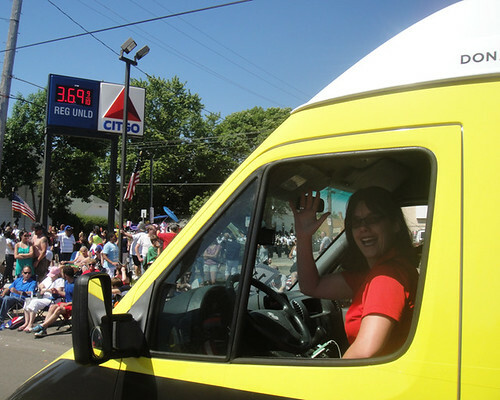 We received our warmest welcome yet when we participated in Racine 4th of July Parade with the local Citgo station. The Sunshine Inn is across the street from the Citgo station in Eden, WI. We stopped in for a surprise story time and let the children pick books from Clayton’s Collection. These pictures only cover a small part of our big trip to Wisconsin. You can check out more pictures on Flickr, videos on YouTube and daily updates on Facebook and Twitter. Until next time, safe travels through the pages. Some of our best friends come from books, others we find by giving books away. 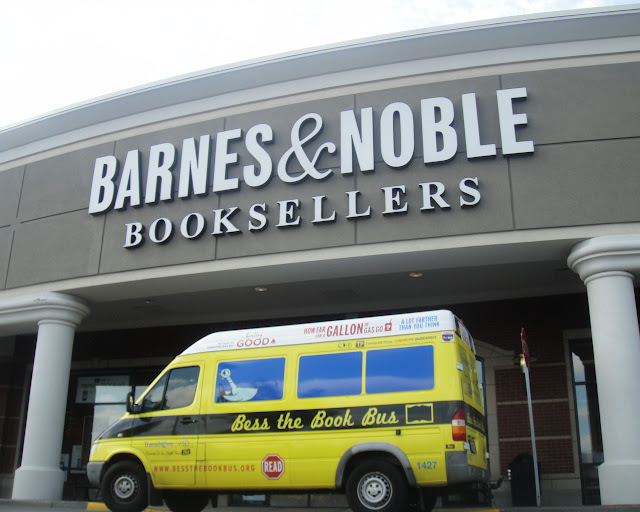 Over the past eight years, Bess the Book Bus has grown with the help of nationwide support. Our success is built by the hard work of organizations and individuals dedicated to helping our children. No specific title has stuck when addressing everyone involved in our success. Sponsors, supporters, or partners never seems to say enough about what these people and organizations mean to us. So we address them for who they are. We call them friends. Our most recent stop on the 2011 Transitions/VSP Success is in Sight Tour was Greeley, CO. There we would meet our friend Mrs. Margaret Richmond. Having suffered from an aneurysm many years ago, Margaret is unable to drive. That does not stop her from serving her community. She is a true inspiration. With help from her daughter Martha, she gives children books, toys and hand-sewn blankets. They give more than 500 blankets each year to hospitals, shelters and group homes. One of the closets in their home, a deep walk-in closet lined with rows of shelves, is full of giveaways. And Margaret and Martha keep toys handy in the car, just in case they encounter a child while they are out. There is a lifetime love of helping others inside Mrs. Margaret. She can remember with misty-eyed clarity the day she met Helen Keller. She also looks up to her father, who was a professor at Southern Methodist University in Texas. Their home was always full of books and Margaret was encouraged to read and ask questions. Margaret and Martha recall first seeing Bess the Book Bus on The Early Show in 2009. Bess reminded Margaret of her father’s encouragement to become a lifelong reader. 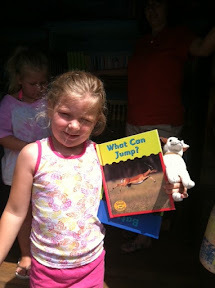 She felt compelled to join us in bringing the joy of reading to our kids across the USA. Now it was time to bring those children’s joy to Margaret. Taking a detour at Kansas, we headed to Colorado to meet our friend. Margaret and Martha joined us at our events at the Greeley Boys and Girls Club and the Casa del Milagro Head Start. Several hundred books from Candlewick Press, Simon&Schuster, Penguin and Townsend Press went out between the two events. It was our first time in Colorado, and we can’t wait to go back. Friends like Martha and Margaret will always have a place on the book bus. Until next time friends, happy travels through the pages. Drop us a line and let us know what you are reading. Bess the Book Bus is proud to partner with Penguin and We Give Books to support the 2011/2012 Transitions/VSP Success is in Sight Tour. Sign up at We Give Books. There are hundreds of books to choose from. Help us reach our goal of 2,000 books by reading any of these great Penguin titles. 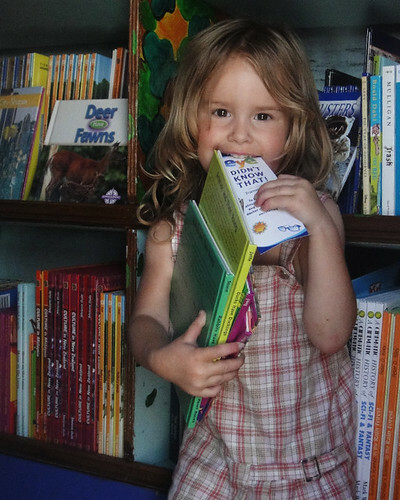 We Give Books also helps some of the world’s best, most inspiring, literacy organizations by spreading the word about their great work and by providing books to the young people these organizations support. With less than a week left in class, the students of Mason Elementary receive a special treat. Second and third graders entered the auditorium and wait for an unexpected guest to arrive. They found out that morning that an author was coming and she has a special story to tell. Margaret Mason (no relation) quietly enters and stands on the stage and opens her book, “These Hands.” She turns the page and the grandfather says that his hands could do anything. “These Hands”, published in 2010 and illustrated by Floyd Cooper, follows a heartfelt talk between a grandfather and grandson Joseph. He remembers the past, he remembers growing up in Detroit and he remembers all the wonderful things he could do with his hands. They could play piano, shuffle cards and swing a baseball bat. Mason turns the page, and the grandfather says that his hands could do anything but handle the dough at the Wonder Bread factory. The hands that Mason writes about belonged to her friend Joe Barnett. In the 1950’s, African American workers were only allowed to sweep floors, load trucks and repair machines in bread factories. The discrimination went on for years before the passing of Civil Rights Act. Barnett worked tirelessly as a leader for the bakery unions that brought an end to the discrimination. Mason turns the page and the grandfather says it took hands joining hands to overcome. It took an organized community to fight for itself and for its children. As a result of of the community joining hands all those years ago, Joseph is able to play piano, shuffle cards, swing a bat and bake a loaf of bread. Mason turns the page and the grandfather says that your hands can do anything, anything at all. And although all hands are now free to reach for dreams, the tools to succeed seem out of reach for so many of our children in underserved communities. Detroit Public Schools has one of the nation’s lowest graduation rates in the nation. The school system is also managing $325 million in budget cuts threatens to close 29 schools and reorganize an additional 50. And when a problem threatens to limit the futures of children, it takes an organized community to make change. There is no single answer to solving the problems of the education system. The students of today can’t wait while hands are tied by five year plans. There are immediate needs that can be addressed by the combined efforts of individuals and organizations in the community. Mason’s presence in the school is part of her commitment to empowering youth by teaching through oral history. Her visit isn’t the only example of community action. 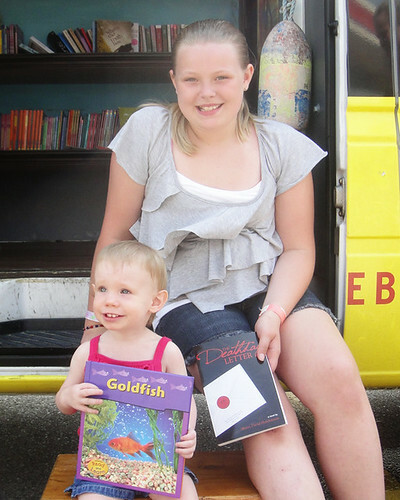 Emily Martens, a 12-year-old Girl Scout from Cincinnati, organized a book drive and donated several hundred books to Bess the Book Bus reached through her community and on into Detroit. Earlier in the week, author Deborah Diesen visited MacDowell Elementary to read The Pout Pout Fish to students and encourage them to work hard. The ongoing efforts of individuals in the community greatly strengthens the futures of students. The Eight Mile Boulevard Association has been linking local business efforts for 18 years to revitalize the community. Its partnership with Citgo will help improve the schools. It ties the Fueling Good movement in on the local level. Their presence in the schools will mean ongoing book drives and fundraisers to help put the future back in these students hands. Leave us a comment to let us know how you are giving a helping hand in your community. The 2011/2012 Transitions/VSP Success is in Sight Tour continues with stops in Missouri, Kansas and Colorado. 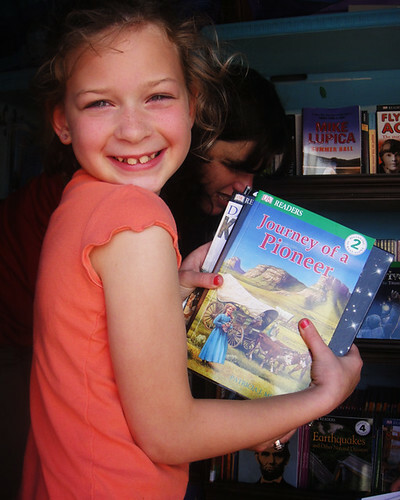 For daily updates, you can follow Bess the Book Bus on Facebook, Twitter, YouTube and Flickr. The Detroit sun beats down on the loose gravel lot behind MacDowell Elementary. A sudden wave of record highs makes the ground shimmer in the shape two brightly colored buses and a tent. From un-airconditioned classrooms, children looked out the window wondering if what they are seeing is real. The intercom interrupts class to announce that guests from Florida and California have come to give away brand new books and eye exams. There is less than a week left in the school, but this is the day Ryanne had been waiting for. She knew that is was coming, but it still felt like a mirage. In the middle of English Language Arts, her and her fifth grade class put down their pencils and pushed in their chairs. They left the vocabulary review and crosswords on their desks and went outside. One by one, students exit through the double doors of the auditorium. Faint music with a pop techno beat first greets the students, then a cartoonish voice. They run toward the voice, toward the tent and starting cheering for Radio Disney. BC, the emcee of the D-Tour, gives away posters and rub on tattoos, then the students filter into two lines – one for the yellow bus and another for the blue. Ryanne enters the short line for the bigger blue bus first. The 45-foot custom built bus named SeeZar features two fully functional exam rooms. Ryanne has a seat and is quickly seen by an optometrist. Ryanne has been having trouble in her classes. Headaches made it hard to focus. Books were hard to read. Recently, her glasses were stolen from her locker and she wasn’t eligible for new glasses for another year. 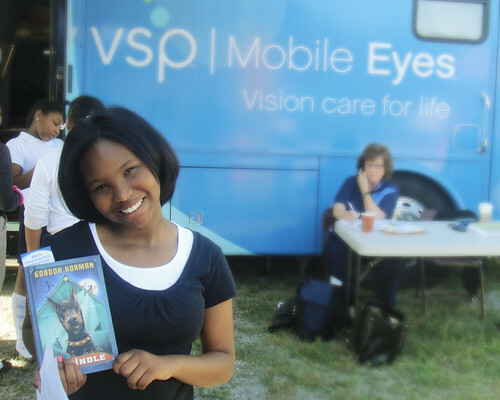 The 2011/2012 Transitions/VSP Success in Sight Tour brought the resources to give the gift of healthy sight and brand new books. The event, which was hosted by SVS Vision Care, made it possible for 70 students like Ryanne who are not able to afford glasses or eye exams. The American Optometric Association found that one in four children have an undetected vision problem that could impair learning. The services provided by Transition Lenses, VSP and SVS Vision make it possible for students in low income areas to stay competitive in the classroom. 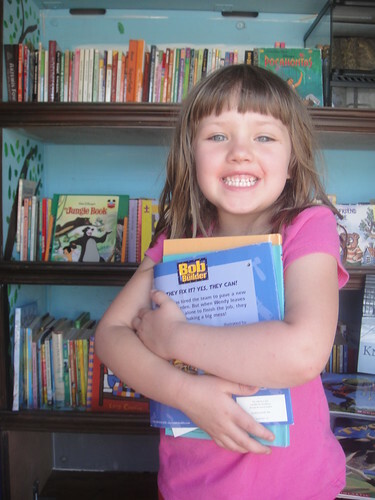 In addition to the eye exams, more than 2,000 books were given away to Ryanne and her schoolmates. The day was a success, but tomorrow’s event would top it. Bess and SeeZar arrived early the next morning at Schultze Elementary. Temperatures promised to reach 95 degrees. And during the eight hour school day, more than 770 students would board Bess the Book Bus. SeeZar would screen 95 students and give away gift certificates to the additional 35 students who couldn’t be seen before the final bell rang. The visit to Michigan marks the 10th state on the Transitions/VSP Success is in Sight Tour. 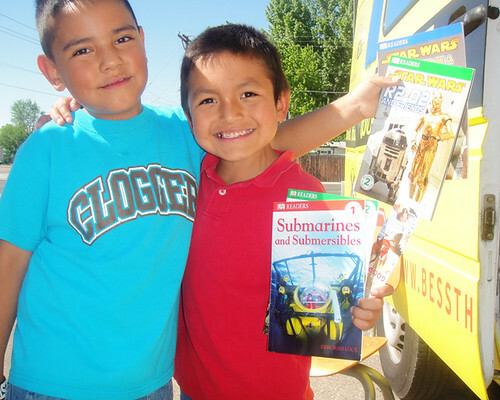 We’ve traveled more than 5,000 miles and donated more than 18,000 books. The tour continues on with upcoming stops in Kansas City, KS and Greely, CO. Don’t forget to follow Bess the Book Bus on Facebook, Twitter, YouTube and Flickr to stay up to date on our travels. 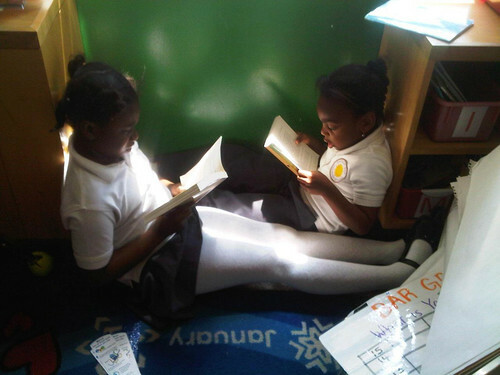 Students at Harlem Day Charter School drop everything and read after receiving six brand new books from The Book Fairy. The opening moments of Book Expo America look like scenes from the day after Thanksgiving. Lines form inside the Javitz Center hours before the gates ever open. Veterans of the trade fair make maps and plans. Itineraries read like strange shopping lists – head straight to Harper Collins then to the 3400 aisle for new releases from Penguin then to table 10 for the Mo Willems signing. At the end of the three day convention, attendees walk away with more than sore backs and swollen ankles. There is still work being done. People trade hand shakes, business cards and “So what do you do’s?” Publishes sit down with booksellers to strike deals on the fall releases. There are also expo featured conferences on the future of print and ebooks. Reasons for attending vary from person to person, but for Bess the Book Bus, it has always been about one thing- saying thank you. 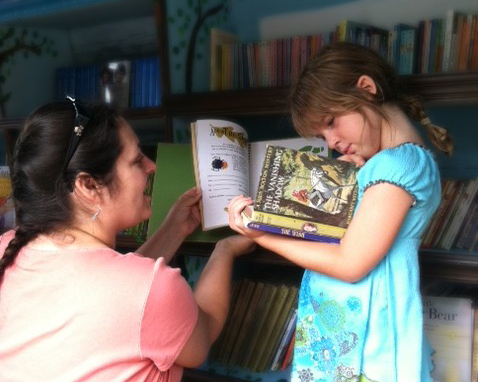 Most of the year, Bess the Book Bus brings children incredible stories from authors. BEA is one of the few opportunities to bring authors incredible stories from our children. It has become a tradition to share our successes with the people who create the stories. Such valuable face-to-face time has made it possible to both strengthen existing relationships and foster new community partnerships. In 2009, a school librarian was shocked when she saw Bess the Book Bus on The Early Show. She was shocked again three days later when she saw Jennifer Frances walking around BEA. Erin Blad/Johnson took the opportunity to approach Jennifer and explain the need for books at Harlem Day Charter School. The eight-year-old school was seated at the base of the Taino Towers in Harlem. The building space is shared with a Head Start, Magic Johnson Computer Lab and Section 8 housing. More than 80 percent of the students live in poverty. Many live in the towers. Harlem Day is one of the few charter schools to have a full-service library. 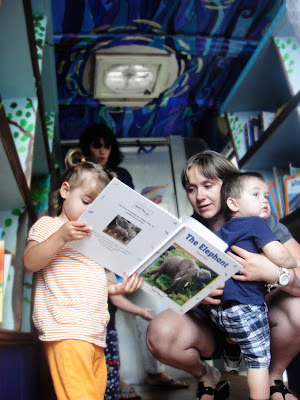 Bess the Book Bus would be one more way to help the students get books into their homes. 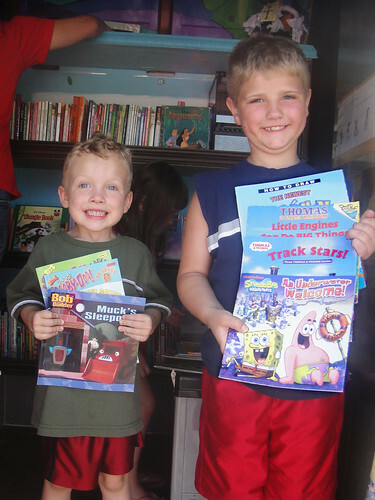 A book drive held by sponsors made it possible for each student to get two new books. The swine flu pandemic kept students from entering the bus that year, but it couldn’t keep the teachers from meeting us in NYC and bringing the books to the children they love. Bess the Book Bus returned the following year, and students received the full experience of getting on the bus and having a raucous story time. We were met with a surprise, music teacher Brian Duran wrote and performed a Bess the Book Bus song with his kindergarten class. Students have mixed memories of Bess the Book Bus. Some remember what book they picked, while others remember the bus being green. One child said that all of the books in his home are from Bess the Book Bus. The 2011 Transitions/VSP Success is in Sight tour continued as we flew to New York City and took the A train to Harlem Day. As groups came to library, some instinctively headed outside to see the bus. Bess didn’t make the trip, but book shipments from Capstone Publishers and Townsend Press did. A free book fair was set up in the library and students came in small waves to pick their perfect books. All week, third grader Korrin asked when it was going to be Book Fairy Day. The time finally came and it took two days for all of the students to pass through the library. 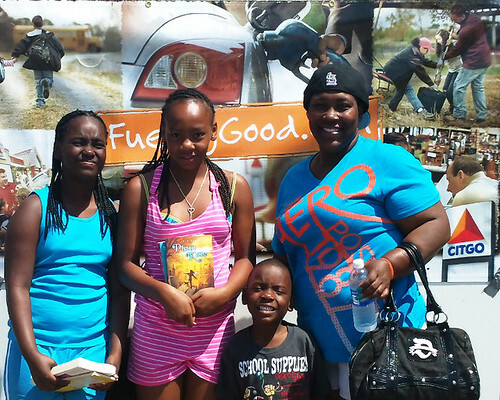 A total of 4,239 books were given out. Each student received at least six books. Transitions/VSP also donated 35 vouchers for healthy sight. At the end of the event, teachers were able to pick from the remaining titles to build classroom libraries. It was extremely important get these books to the students and teachers. Harlem Day will be switching to Democracy Prep at the end of the school year, and new changes will take place. The changes include increasing classroom sizes and disbanding the school’s library. Democracy Prep will be adopting the Accelerated Reading program, which utilizes a structured classroom library and additional testing to monitor reading levels. 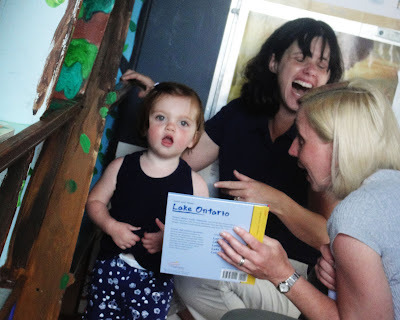 The program is widely used and recognized for its merits, The program is widely used and recognized for its merits, yet diminishes the importance of choice for children who are learning to read. 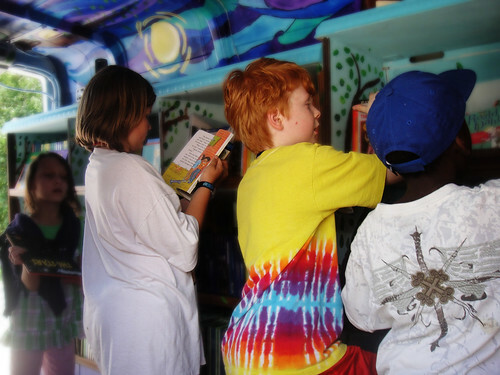 Richard Allington’s three year study showed that children in low income areas with little access to books that had the opportunity to choose their own books for summer reading had gains equal to or surpassing that of children given three years of intensive instruction during the summer. Fortunately, we were able to give our kids that choice again this year.